Nathan Kalish was recently named to Rolling Stone Magazine’s “10 new country artists you need to know” list. Of course, Kalish has been a friend of the Taste of the Catskills Festival for years, so we’re glad that Rolling Stone finally gets it… Anyway, our buddy Nathan Kalish is a hard-touring singer-songwriter and band leader from the American Midwest, currently calling Nashville home after having spent most of the last decade on the road. His latest album 'I Want to Believe' was produced by David Beeman and is an independently released country-Americana record with a tip of the hat to psychedelic, folk, and rock ‘n roll, and we encourage you to check it out below. A band that has a crowd pounding their fists through tables one minute and sitting silently on the edge of their seat the next, Swampcandy is dirty and sweet, brash and thoughtful, simple and complex. It’s true stories that are made up just for you. It’s pig drinkin’, whiskey eatin’, foot clapping’, hand stompin’, American music. Their roots are fermented in American mud, primitive blues, pre-war folk sounds, field hollers, gypsy jazz, and ragtime. Steeped in influences from Robert Johnson to Radiohead. Their sound is distilled in a boiler of mercurial energy swirling with tempo changes, dynamic peaks and valleys that hold the ear and refuse to let go. Swampcandy has averaged 225+ performances per year since 2011. They’ve done multiple tours of the eastern US, the UK, and Ireland. They’ve released 4 full-length albums, and 2 Eps…and they take over the scene everywhere they land. After debuting as a solo performer in 2016, KidBess (Bess Greenberg) introduced a full band sound, including stud players Michael Wu (The Gunpoets) on electric bass, and Joe Alston (Milkweed) on electric guitar. The smokey texture of Greenberg’s haunting, poetic vocals are reinforced with infectious grooves and harmonics that swell with a unified conviction. Where psychedelic rock meets singer-songwriter and grunge meets world beat, KidBess and The Magic Ring are a syncopated and driving wave: moving, mesmerizing, and lighting up the region. 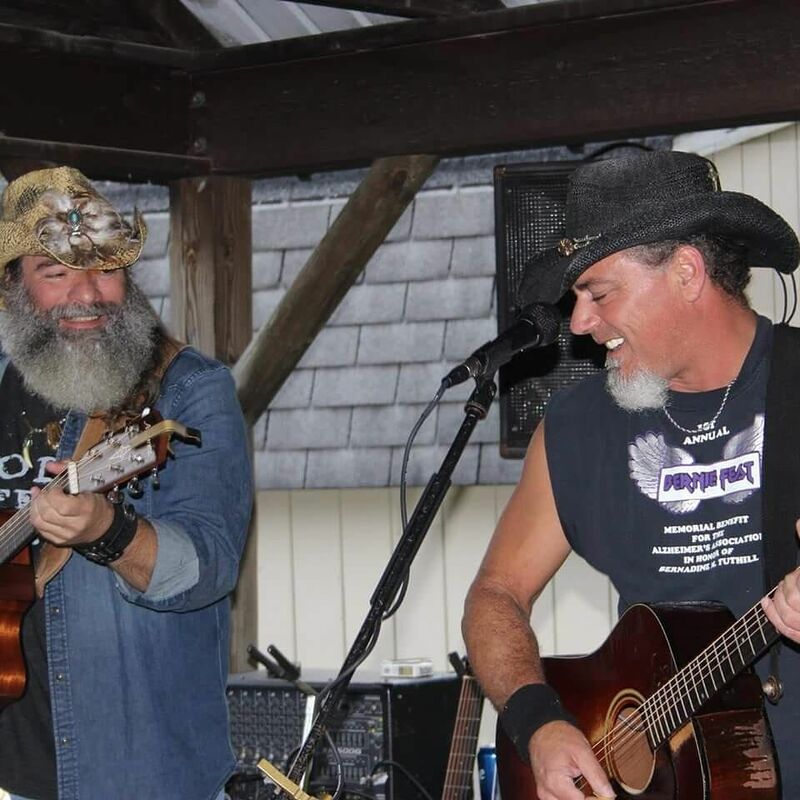 For years (and years), the two biggest regional names in Outlaw Country have been Gene Hummel (Hummel’s Jug, Gator Stu) and Tim Ruffo (Tim Ruffo Band, Ruffo Brothers). Honestly, we’re not sure if our modest stage can accommodate such a massive combination of star-power talents, but we’re going to do our best. For the first time ever in the Catskill Mountains region, we present our very good friends, Gene Hummel and Tim Ruffo: together on the same stage Sun 10/07! The Neighbors are all-star purveyors of all-American roots music, blues, Americana, classics, oldies, and various audible wonderments. The band features the signature, powerful vocal stylings of Calya Perricelli, and includes ace players Pete Ruttle (harmonica, dobro, vocals), Joe Kollar (guitars, vocals), Joey Arcuri (upright bass, vocals), and Will Sigel (drums). Kollar, Arcuri, and Sigel are also members of the wildly popular band Driftwood, just in case any of those names look familiar. The Neighbors are far too cool to have much of an internet presence to speak of, but check out the videos below, and (whatever you do) make sure not to miss their set on Sun. Really. Based in the Catskills, Becca Frame and the Tall Boys provide a timeless presentation of powerful vocals, and transcendent lyrics. Combined with polished yet improvised guitar work (Brian Shafer), intoxicating dynamic rhythms (Steve O'Connell and Daniel Colón), and Becca’s phenomenal voice, the band provides a strong dedication to stir the soul. Each song has its own desire and persistence to leave the audience wanting to hear more, in a big way. Although Mike Herman started out as a “flatlander” (from downstate), he journeyed north and conquered the Catskills some years back, thank goodness. Mike's music treats the listener to a pleasing blend of his musical influences - including blues, bluegrass, rag-time, and old-timey - and blends them into a musical creation uniquely his own. His originals speak of life and the trials and tribulations it may dish out. His whole-souled talent and skill in composing is only heightened by his masterful marriage of words and music. For more than 15 years, the Catskill-based Stoddard Hollow String Band has entertained audiences throughout the region with their unique style of traditional and original old-time tunes, and some songs you wouldn’t expect from an old-time string band: songs that may start out slow with a traditional feel, often end up as foot-stomping, hand-clapping party tunes. The group began with the team of Marvin Zachow (fiddle and vocals) and Eddie McGee (banjo and banjo uke). They were then joined by Frank Frazzitta (guitar and vocals) and Joel Murray (bass). The newest member, Dave Rama (banjo and vocals), rounds out the mix of this fun-loving band. Whether playing at a farmer’s market, house party, tavern, or up on a public stage, this acoustically-based band is one you won’t want to miss. The Technicolor Trailer Park folks, known to some as Lisa Gould (guitar, vocals) and Jerry Tanner (mandolin, vocals), are an entirely entertaining, thoroughly smile-inducing, harmoniously harmonizing acoustic duo…and long-time buddies of ours. In fact, they are the only musical act performing both days at ToCFest this year. Don’t miss ‘em! John Houshmand has enjoyed a distinguished career as a composer and guitarist for Laurasia, the Audio Artists, and East River Consort - as well as being a solo guitar wizard, working in the tradition of real-time improvisation. Houshmand opened for Ralph Towner, Shadowfax, and plays the heck out of (among other things) electric, acoustic, baritone, and toy guitars. Joel Murray is a multi-instrumentalist/vocalist/blackbelt/architect/superhero who hones his chops, crafts his ditties, and hatches his schemes atop a Catskill mountain, where his splendorous shack overlooks our beautiful, bountiful region. You may have enjoyed Joel in such bands as Stoddard Hollow String Band, and/or Altered Walter. Trust us: he’s extra-nifty when solo. Delhi’s “First Family” (first in our hearts, anyway), The Ryan Family Band is fronted by big John Ryan, of course (vocals, ukulele), and NYC pro player Paul Ryan (vocals, guitars). Other Ryan family members will be accompanying the afore-mentioned Ryans, and they may well have a special guest or two, too. The Ryan Family Band is always full of surprises, and shrouded in mystery. We can all, however, expect a compelling old-timey acoustic performance from said Ryans: some of our very favorite folks – and some of the most talented, and capable, folks we know, thankfully. Enjoy!